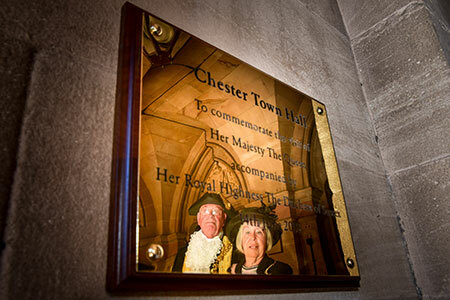 A plaque has gone on display to the public in the entrance to Chester Town Hall to mark the historic visit of the Queen and the Duchess of Sussex. Residents are also invited to view a selection of photographs and memorabilia in display cabinets to celebrate the successful event, which attracted 14,000 people and drew the attention of the world’s media on June 14th. Cheshire West and Chester Council and the City of Chester welcomed Her Majesty the Queen and the Duchess of Sussex who came to the city to officially open Storyhouse. They were taken on a tour and met a number of local community groups and young people. Thousands of people welcomed the Royal visitors in the sunshine as they then made their way along Northgate Street to the town hall. They were greeted by the Lord Mayor of Chester Councillor Alex Black who thanked everyone for attending. The Queen unveiled a plaque to mark the visit before she and the Duchess enjoyed lunch in the town hall as guests of the council. News organisations from across the globe were in Chester to broadcast the event, which made the news in Australia, France and America in addition to receiving coverage in the national and UK media. The increase in visitors boosted the local economy, with a 16 per cent rise in the number of people visiting Chester Market on that Thursday compared to a week before. 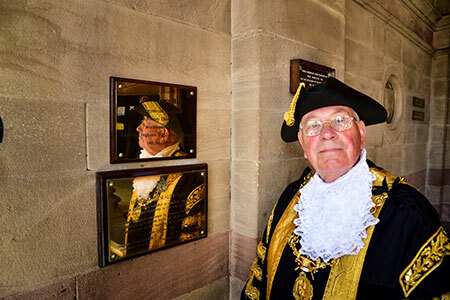 Councillor Bub Rudd, chairman of Cheshire West and Chester Council, said: “Council representatives have estimated that around 14,000 people came out to witness the historic visit to Chester. It was amazing to see so many people who lined the streets of Chester to welcome Her Majesty the Queen and Her Royal Highness Duchess of Sussex.